Selecting the best fishing line for bass is really confusing for most anglers. Enough knowledge regarding fishing line is essential for picking the best one. If you are more prepared, you can address the problems you are facing. Basically, three types of fishing lines are available for bass fishing, which include braided, fluorocarbon, and monofilament. Each of them comes with its own pros and cons. Each of them is also useful for different situations. You must be aware of the line diameter, abrasion resistance, stretch, and pound test for selecting fishing line for bass. Monofilament: Once, monofilament was the most favorite fishing line of anglers for many years. But now, the popularity of this fishing line is declined due to the introduction of two innovative fishing lines. Monofilament fishing line is manufactured by using a mixture of polymers. Then chemicals are added to this mixture. The quality of Monofilament fishing line depends on the quantity and type of chemicals added during the production. Consistent diameter, abrasion resistance, stretch, and strength vary between manufacturers. Fluorocarbon: Fluorocarbon fishing line is identical to monofilament. Light reflection and refraction are the major difference between both these fishing lines. The optical density of fluorocarbon is less than monofilament. Braided Fishing Line: Braided fishing lines are created for meeting the demand for stronger fishing lines with thinner diameters. Originally, Dacron or polymer is used for manufacturing these fishing lines. Now, they are called super lines. KastKing SuperPower is a braided fishing line that is designed for increased durability and casting distance. You can use it without the fear of break-offs or frying. Durable fibre is used for making this fishing line. It provides you low memory, which is helpful for achieving a better, farther casts. The chance of wind knots is also very less. It can provide you greater abrasion resistance. Zero stretch and ultra-high sensitivity is the other peculiar feature of KastKing SuperPower. Thus, it offers superior hook setting, which is helpful for increasing your catch ratio. 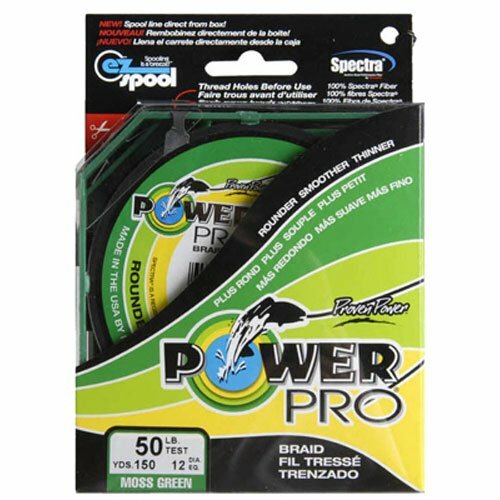 The PowerPro Spectra is a fiber braided fishing line that comes with varying diameters and lengths. It uses braided Spectra fiber, thus this fishing line is incredibly strong. In order to get extreme sensitivity, it is treated with enhanced body technology. A 3-end braided construction is the most important quality of this fishing line. Thus, it offers almost zero strength. It allows you to spool directly from the box. The remaining line is protected by the package. Impressive strength is the other important quality of PowerPro Spectra, which is helpful for avoiding frequent breaking. PowerPro Spectra is very thin. 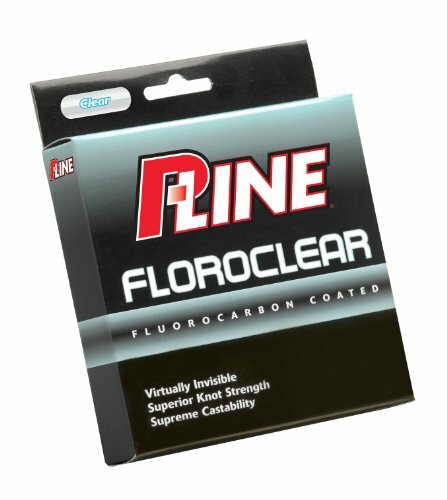 P-Line Floroclear Clear fishing line is virtually invisible once it enters the water. Thus, it provides you more stealthy presentation. So, you can make more hookups and strikes. It comes with a special silicone treatment. So, it offers you a reduced memory. At the same time, the castability of P-Line Floroclear Clear is impressive. 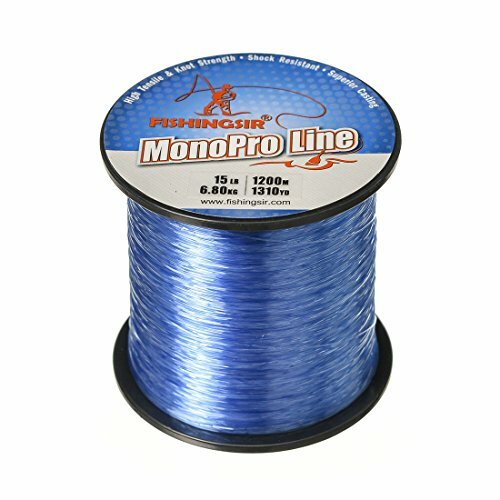 FishingSir MonoPro Monofilament is a very strong and abrasion resistant mono line fishing line, which is made of superior nylon material. It is considered as the finest professional tournament grade mono fishing line. It offers you superior strength and durability. Thinner diameter allows you easy long range casting. Superior winding technology is the other peculiar feature of this fishing line. FishingSir MonoPro Monofilament very soft and smooth. The manufacturer of this fishing line follows strict quality control standards for the production of this fishing line. It has a tough and durable design. High tension strength and abrasion resistant reliability are the other peculiarities. 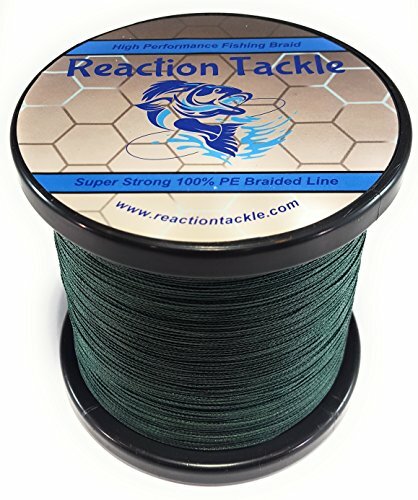 Reaction Tackle Braided Fishing Line is a high-quality fishing line that offers ultimate strength and near zero stretches. The strongest fiber in the world is used for manufacturing this fishing line. It is also manufactured to the highest quality standards. Fishing line is an important equipment for fishing. With it, you can feel the fish is biting your line and you know it is time to catch the fish. There are types of lines; here I will talk about the best fishing line for bass. For bass fishing, you will get three types of fishing line and they are perfect for bass fishing. But you have to learn about the force, stretch, and resistance of a fishing line. So this article is important for every fisherman who wants to fish bass. In this part, I will talk about the best fishing line. The lines are powerful and strong to help in catching fish. For bass fishing three types of line are popular- they are fluorocarbon, braided and monofilament. Each is best for their own features. Let’s look at the brands and know them in brief. This line is smooth and slim. You will not face any problem while dragging the line. But don’t think it is not perfect for catching big fish. The line is strong and long lasting. Carp, bass, catfish can be caught easily with this line. The line is colorful and easy to locate in the water. You can see it clearly when you are dragging a fish with it. This fishing line is best for fighting with big size fish. You can use this line in any fishing rod. The strength of this line is awesomely powerful, you will get a big fat fish easily with the power. The stretch ability is perfect and the shock resistant helps your fishing ability strong. This fishing line is now the most popular line for every fisherman. The polymer material and water resistant feature make the line stronger than any other line. This line best for slow biting fish. It works in spinning reel and helps to control the fight with the fish properly. It is a common story of every fisherman that losing g a fish. It all happens for not picking the perfect line weight. You have to pick the weight line for the type you want to fish. The line strength of a fishing line is known as a test. You can identify the strength by the test number. The measurement of the test is a pound. After seeing the number and pound you can guess this line can bear up to this weight. 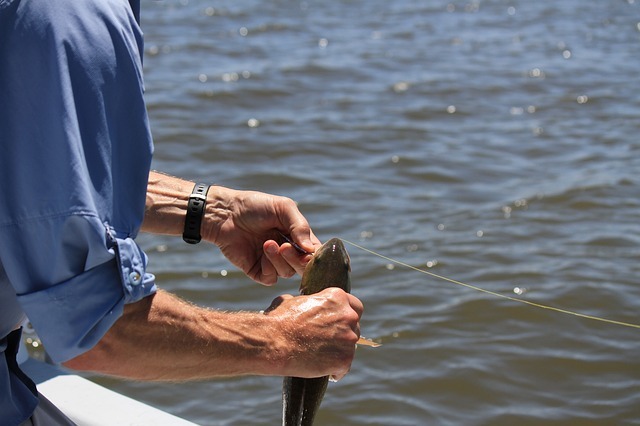 At first, decide which fish you want to catch with your fishing line. Then decide which place you are going for fishing. Do some research on the weather condition of the place you want to fish. All these factors are related to the weight line. Your fishing line weight has to be adopted in these conditions. If the weather or place is not perfect for the line then it will break. The line strength depends on the pound measurement. You have to test the line about how much weight can the line take. If the weight is too much then the line will break. Like if the line has the label 9lb, then it can take 9-pound weight easily. But it will break if the weight is more than 9 lb. If you use a knot, the line gets weak. Environment condition can break the line strength. If you are not using the line for quite some time, the strength of the line reduces a lot. Sometimes when the fish struggles much then accepted then you will face a break in the fishing line. The size really matters when you are with bass fishing. A braided fishing line is able to carry more ponds than any other fishing lines. Fluorocarbon fishing line can catch higher pound fish. For this, you have to know the type and size you want to fish and the weight line. I can give you a simple idea. For fresh water fishing for panfish and trout. You can go for 2-4 pound test. For catfish, bass, salmon, and walleye you can pick 6-12 pound test. Pike, catfish, and stripers are perfect with 14-20 pound. For saltwater fishing like sea bass, trout and flounder 8-14 pound is best. Blues, stripers, and redfish can be fish with 16- 25-pound test. And lastly, shark, tuna is perfect with 30 lb test. So you can get the idea about which species is best for which fishing line. You may think when you have chosen the perfect fishing line and weight for bass fishing then it is easy to catch a bass, then you are totally wrong. As it is big fish, you have to follow some tips to catch it easily. Bass loves to stay in cover like boat, wood, rock etc. you have to place your lure in the cover. The cover may not help you to catch one but apply some techniques and you will catch one. As bass fish is foody, you can use any bait to catch them. At first, observe the location you want to fish then use lure according to the baits that are there in the water. Don’t use only one technique when you are fishing a bass. Be an all-rounder and practice some techniques to catch fish more easily and fast. Consider the weather when you are in a fishing mood. Bass fish stay active in the cloudy day and in the night. After all the consideration and observation, I think you have enough information to know about the best fishing line for bass. When you want to fish a bass, at first select the species, then the size, then the place and lastly the fishing line that is appropriate for your fishing criteria. If you can make this happen then you will have the most memorable fishing experience in your life. Bass fishing is a very popular sport in America. Anglers fish for bass because of a number of reasons. You can see bass around the country. It is very huge, that range from one to 20 lbs. Besides, fishing for bass is also exciting because they are aggressive fish. It is also very easy to learn bass fishing. You can acquire this skill with some patience and practice. Now, selecting fishing line for bass is also very easy. You can pick the right product from this list very easily.